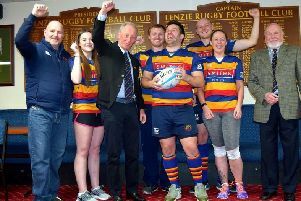 Lenzie enjoyed a winning start when they travelled to Ayr for the first competitive game of the season in the Regional Shield. Their opponents were a competent Millbrae side who defeated Lenzie home and away last season, but it was Lenzie who took the honours this time with a 35-23 success. The weather was blustery and the park was in perfect order for both sides to serve up an entertaining and fairly contested match. Within 10 minutes it was all square at 8-8 with McWilliams opening the scoring for the away side in his comeback game following a long recovery from injury. Lenzie kept the ball moving against a heavier home side and Scouller added another try by half-time following good play by Moir. The second period belonged to Lenzie for most of the time, although Millbrae scored two well worked tries from close range. Newly appointed coach James Le Mar was delighted see further tries from captain Letford, debutant Shearer, Lowrie and Moir as Lenzie moved the ball and supported the ball carrier throughout the game. Man of the match was prop forward Graeme Condie. Next week Lenzie have Paisley away in the next round of the Shield competition.